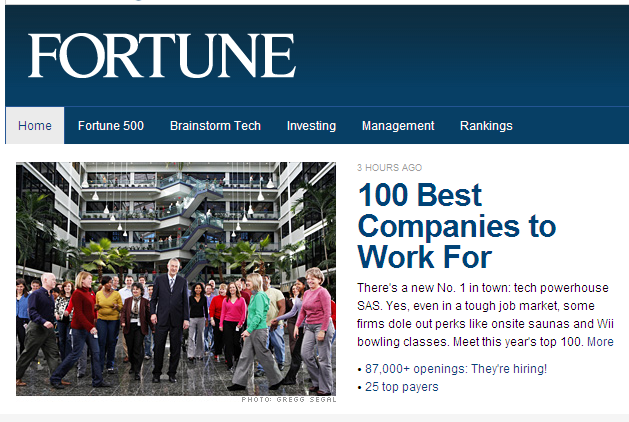 For the seventh straight year, Fortune magazine has named Mayo Clinic to its "100 Best Companies to Work For" list. Mayo came in at #55, up eight spots from last year. In a related article called "Creative recession solutions," the magazine highlighted a few initiatives from employees that helped Mayo reduce expenses in these difficult economic times. If you're a Mayo Clinic employee, thanks for all you contribute to make Mayo a "best place" to work, and for the creativity and energy you bring to serving our patients. If you would like to comment on this recognition, or tell your story about what you think makes Mayo special, you can do so on the Fortune article, on our Mayo Clinic Facebook page, or in the comments below.